UMaine baseball players (from left) Shane Bussey, Brett Chappell, Danny Diaz, John Arel and Christian Garabedian play a game during warmups on Thursday prior to their America East tournament game against Maryland Baltimore County at LeLacheur Park in Lowell, Massachusetts. University of Maine athletic trainer Ben Randall (left) works with Black Bears freshman pitcher Justin Courtney prior to Thursday's America East playoff game against UMBC. 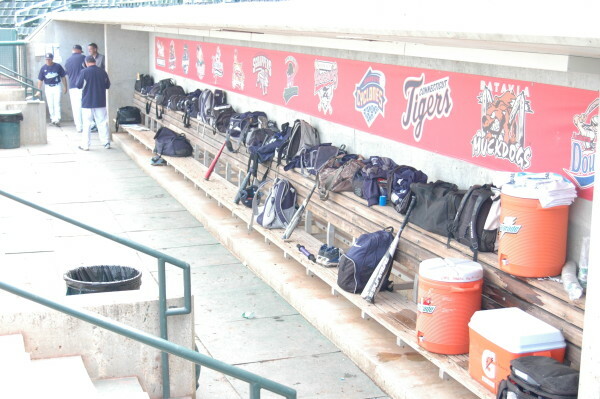 The University of Maine dugout sits empty as players warm up for Thursday's America East Baseball Championship game against UMBC at LeLacheur Park in Lowell, Massachusetts. LOWELL, Massachusetts — The University of Maine’s season will be on the line Friday afternoon. Coach Steve Trimper’s No. 3 Black Bears will face fourth-seeded Hartford in a 1 p.m. elimination game at LeLacheur Park. UMaine is coming off Thursday’s disappointing 9-5 loss to No. 2 Maryland Baltimore County. Senior Scott Heath of Westbrook will get the baseball as he attempts to extend his career while keeping the Bears’ season going. The left-hander (6-3, 3.86 earned run average) hopes to set a better tone on the mound than UMaine received in its opener. “Heath is just a bulldog,” Trimper said. “He’s going to go out there and he’s going to grind. UMaine used six pitchers on Thursday, but hopes Heath will be able to help the Bears start fresh. The team already has exhibited its resilience this season, fighting its way out of last place with a strong stretch run. Offense has been a concern for UMaine during America East play this season. The Black Bears will need to bump up their production if they hope to stay alive on Friday. UMaine posted a team batting average of .249 in 20 regulars-season conference contests this spring, and only senior Luke Morrill of South Thomaston hit .300 among the everyday players. UMaine is making its sixth consecutive America East postseason appearance. The Black Bears have won five titles, the last in 2011. UMaine has advanced to the championship round three of the last four years. The favorite in the four-team, double-elimination tournament is top-seeded Stony Brook (32-14-1). The Seawolves are four-time champions, including the 2012 season during which they advanced all the way to the College World Series. Stony Brook has made 10 straight trips to the America East tourney. The tournament winner earns an automatic bid to the NCAA Division I Baseball Championship and secures a spot in a regional. UMBC is the surprise of 2015, having won 30 games for the first time since 2002. The Retrievers’ second-place finish is their highest since joining America East in 2004. UMBC is making only its second tournament appearance after going 0-2 in 2008. Conspicuous by their absence are Binghamton and Albany. The Bearcats, who had won the conference title the last two seasons, finished last at 17-24-2 (6-16-1) and did not qualify for the postseason. The Great Danes (14-28, 7-13 AE) finished sixth and are on the outside looking in for the second year in a row after making five consecutive appearances. When Justin Courtney took the mound for UMaine on Thursday, he ended a lengthy drought of sorts. The freshman righty, who on Wednesday was named to the All-America East Second Team and the All-Rookie Team, became the first former Bangor High School pitcher to take the mound for the Black Bears in the postseason in 24 years. Courtney is the first Bangor High product to pitch in a playoff game for UMaine since reliever Chuck Nadeau appeared in the NCAA Regional hosted by the Black Bears in 1991. Nadeau, a businessman in southern Maine, has been a successful high school baseball coach at Windham and, most recently, Gorham. “[It has] been fun watching Justin emerge. I think he has a nice career in front of him,” Nadeau said via a message on LinkedIn. Senior Heath achieved an offensive milestone on Thursday when he posted his 200th career hit with a sixth-inning single. Heath also has 50 career doubles, which ranks him among the top 10 or so in school history behind Mark Sweeney’s all-time best 66.